Nominate a member of your team for the Saint Louis Chemical Science & Technology Award. This award is presented to a chemist in the St. Louis area who has demonstrated a high degree of professionalism and scientific contribution. Criteria used to judge the award include technical proficiency, presentations, coaching/teamwork, and additional professional activities. The award will consist of a plaque, a $500 honorarium, and dinner for the awardee and a guest at the annual Recognition Night. The Due date is January 1 2016. You can find all the details on eligibility, nominating a candidate, and recent winners right here. To submit a nomination, email the Chemical Science and Technology Award Coordinator David Rhee at david.wonjun.rhee@monsanto.com or phone 314.694.4874. I’m sure you know that joining ACS is good for your career, but did you know just how good it can be? The resources available from ACS to help you manage and promote your career are extraordinary and envied by many other professional societies. Below are the most popular. Volunteers who will share their experience and provide advice on resume preparation, job searching, interviewing, salary negotiation, transitions….Sessions are conducted in person at national and regional meetings, or by phone or email at any time during the year. http://www.acs.org/content/acs/en/careers/career-services/ccp.html to check it out. Every Thursday afternoon, ACS offers a free webinar on a topic of interest to chemists. Check out http://www.acs.org/content/acs/en/acs-webinars.html for a list of upcoming topics, as well as archived recordings of past events (members only). ACS conducts two salary surveys annually – one for the chemical profession in general, and one targeted to recent graduates. This data not only provides a good picture of the current job market (as seen in the Employment Dashboard), but can be used to help negotiate your own salary. A member recently used this data, as seen in the Salary Calculator (https://webapplications.acs.org/Applications/SalaryCalculator/page01.cfm), to get his starting salary offer increased by over $20,000/year, just by pointing out that the company’s offer was below market rates. Did you know that your ACS dues can be waived for up to 2 years if you are unemployed? During this time, you retain access to all member benefits, including the ACS Online Job Club, SciFinder, and free or discounted professional development courses. See http://www.acs.org/unemployed for details. 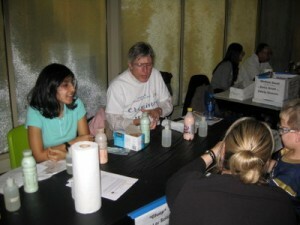 For those looking to learn more about the job opportunities for chemical professionals, ACS offers a series of workshops at national, regional and local meetings on the various market sectors, as well as a web site with supplemental information at http://www.acs.org/content/acs/en/careers/career-services/career-pathways.html. The St Louis Local section has supplemental resources as well. The LinkedIn group “Chemistry Careers in St Louis” is the place to find local job openings, as well as other interesting local events. The Leadership Development Forum (http://www.stlacs.org/leadership-development-forum-series/) is a great place to sharpen your leadership skills, and the Younger Chemists Committee often hosts both social and career events (open to chemists of all ages), where you can meet other professionals. These are just a few of the many resources ACS offers to help you advance your career. Check them all out at http://www.acs.org/careers and http://www.stlacs.org/career-services/. 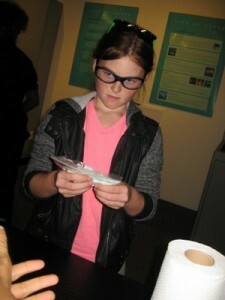 “Kids and Chemistry” haunted the Saint Louis Science Center with Science Spooktacular on Thursday, October 29, 2015, just in time to usher in Halloween (and beat the Chemical Bond deadline). 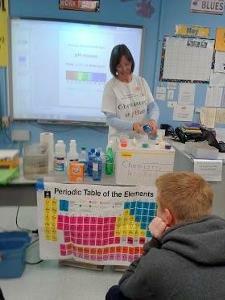 Kids and Chemistry is a program sponsored by the St Louis Section–ACS and coordinated by Sheryl J Loux (sjloux@gmail.com). 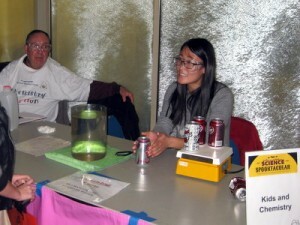 Sheryl thanks volunteers Zhiyun (Judy) Cao, Shreya Ahuja, Don Sartor, and Chris Glass for their eerie efforts. One of the most popular outreach programs sponsored by the St Louis ACS section is Chemistry is pHun! Sheryl is seeking a retiree to take over this rewarding program or if you would like to offer some of these programs in a school district close to where you live, please contact Sheryl J Loux by email, sjloux@gmail.com or 636.237.5149 to discuss the programs. Training is available. 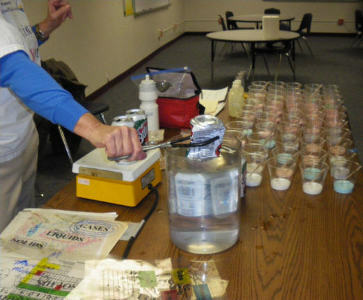 The twenty-four Chemistry is pHun programs in calendar year 2014 — all given by Sheryl — have had an educational impact on 822 students in 10 or more schools. Program activity for the 2014-2015 school year has started strongly this fall. The program modules offered by Sheryl are “States of Matter, “Chemistry is pHun”, “What is Matter?”, Using the Scientific Method for a Science Fair Project, and “Polymers are Marvelous Molecules” (includes DNA extraction from strawberries). Sheryl thanks Don Sartor and Amy Kerkemeyer for helping with some programs. 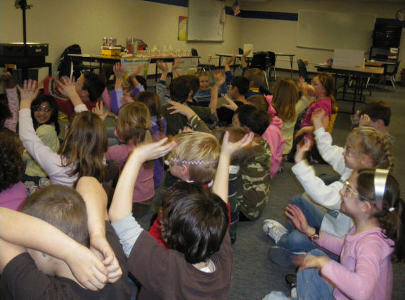 The “States of Matter” program was designed for elementary students and is popular for the 2nd and 3nd grades. The states of matter are explored with solid, liquid, and gas states of mainly water, demonstrating the addition or release of energy in the form of heat when changing physical states. Examples of plasma are mentioned and “Gluep” is made to show a substance that has properties of both liquids and solids. The “Chemistry is pHun” program is designed for grades 4-12 and covers pH, a review of states of matter, dissolution, chemical reactions, and various polymers. Another program for grades K-3 is “What is Matter?” where the periodic table of elements is introduced and water molecules are made with marshmallows for atoms and toothpicks representing electron bonds. Using the Scientific Method for a Science Fair Project is designed for grades 5-8, and “Polymers are Marvelous Molecules” (includes DNA extraction from strawberries) is for grades 7-12. Of the 822 students participating this calendar year, 610 students have enjoyed the “States of Matter” program, 160 students have enjoyed the “Chemistry is pHun” program, and 52 students extracted DNA in the “Polymers are Marvelous Molecules”. See above for details on the Continuity Dinner for the December meeting.